2039: following unprecedented floods, wild capitalism has turned the city of Manila into a technocratic metropolis. The vast majority of the workforce left unemployed by rising automation, unrest is quashed with limited ability. An orphaned child getting slowly used to his full-body prosthetic befriends a young journalist who herself hopes to one day be fitted with similar implants. Together they explore options to customize their respective bodies. Meanwhile, a secretive military contractor is tasked with gathering a strike team. Equipped with the latest weaponry, they train for a product demonstration of combat exoskeletons to a corrupt government. 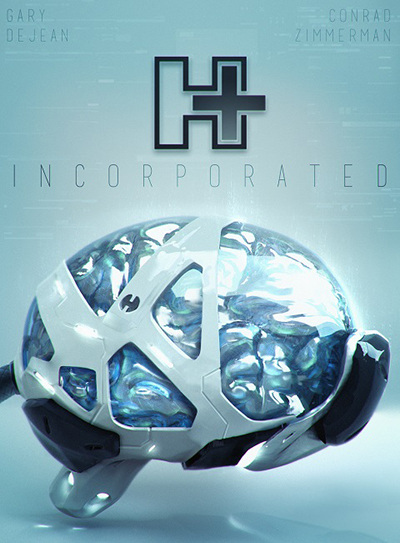 Hard-science anticipation with a strong dose of cyberpunk, H+ incorporated is an epic focused on the transformation of the human condition in the technological era. Book cover illustration by Pablo Kerry. Conrad Zimmerman is a writer, game designer, podcaster and critic living in Philadelphia. Adept of the cyberpunk genre since forever, he kindly jumped on board to offer you a smooth storytelling experience. I strongly encourage that you take a listen to the prologue below. Learn more about his past and ongoing projects at conradzimmerman.com. “This is a surprisingly fast and fun cyberpunk read, less concerned with the punk and more in tune with the cyber. “Action-packed and emotionally-charged (...) the story progresses to a gripping climax. It blips, it flickers, and suddenly it's on: the bluish light of neon tubes falls upon a dozen cheap folding chairs in a windowless room. Footsteps follow; silhouettes limp inside, accompanied by the soft purring of rotors, the friction of steel against plastic, the clinking of canes and prostheses. The figures arrange the chairs in a circle as quietly as their bodies allow. The paint on the walls of the common room is crumbling, ceiling panels are missing, and the fake wooden floor is stained with suspicious patterns. A man with a prosthetic jaw pours himself some coffee from the nearby table while a fifty year old biker takes off his leather gloves, revealing metal hands. A Chinese woman in her late twenties, a third of her face covered in crude cybernetics, helps set up the remaining chairs. A quadriplegic man in an exoskeleton sits down next to a woman with prosthetic legs, the pair bumping fists together with a complicit smile. David and Jake sit next to one another, a chubby Indian and a six feet tall android with a white motionless face, painfully aware of how their brand new clothes make them stand out among the group. To a casual observer, they might appear to be a wealthy eccentric playing dress-up with a smart mannequin, but not in this place. Here, murmurs and glances are exchanged, because everyone is aware that Jake is not merely a machine. A Brazilian rasta makes his way to the circle of chairs and casts a quick glance at the small crowd, pausing briefly on David and Jake. "A couple new faces today," he declares in a thick accent. "Welcome. There's donuts and coffee, if you want. We'll get started in a minute." He then turns to address the middle-aged biker: "How's the elbow, Bill?" Bill curls his right arm a few times in demonstration, producing a light squeak with each motion. "Much better, thanks. You saved me a trip to the choppers with that." "Great! That's great. See, I told you, it's the little things." "No joke. You could be a mechanic." They chuckle. Tying his dreadlocks back with wires protruding from his skull, the rasta finally sits. "So! Before we go around, how's everyone doing?" he asks. The group mumbles assorted, half-hearted variations of "fine" in response; they've all seen better days, but it doesn't seem to affect the rasta's enthusiasm. "Great! Now let's go around the room and introduce ourselves, yeah? Hi. I'm Malcolm and I'm the. group coach, so to speak." One by one, the group identifies themselves. Jake pays little attention to their names, focused instead on their handicaps and the strange solutions modern technology has provided them. When they're done talking, each looks at him with pity. And before he's even thought of what he's going to say, David is already taking his turn. "Hi, I'm David," he says. "Nice to meet you all. This is my son, Jake." Jake's embarrassment at being the object of every gaze in the room renders him incapable of more than a slight nod and a soft "Hi." His unease is palpable and the room is rendered silent as it spreads from one member of the group to another. So as to break the spell, Malcolm speaks up cheerfully. "It's nice to meet new folks. David, Jake, you're among friends. OK! Who wants to go first?" The room remains quiet as glances are exchanged. Seeing the awkwardness of the moment, Bill raises his metallic hand. With relief, Malcolm points to him. "Yeah, Bill?" Turning to Jake, the biker speaks in a playful growl. "These people are too polite to say it, but that's quite a getup you got there, kid." Jake is startled. He had hoped after the introductions that he would be able to fade into the background, but all eyes remain fixed on him. After a moment of stunned silence, he responds: "What?" The bald, armless man points with his prosthetic hand, grinning like a scoundrel. "I'm talking about your workout, son." Malcolm suddenly raises a hand, motioning Bill to shut up. "OK! Thank you, Bill." His voice adopts an apologetic tone as he turns to address David and Jake. "What he's trying to say is that we've never had someone with such. extensive prosthetics. But that's not relevant. Everyone's welcome here." David looks a bit concerned but does his best to mask this with a reassuring smile as he and Jake exchange a glance. Inside Jake's face, soft panels start moving under his artificial skin, mimicking a frown. "OK. Err. Thank you?" the boy timidly replies. "Like he said. You're welcome," Bill contributes, seemingly happy with the discomfort his directness has caused. Pressing further, he asks: "So, how old are you?" Malcolm shoots a disapproving look at Bill before forcing another smile at David and Jake. The Chinese woman leans in, spectating intensely, her artificial eye capturing every moment of the encounter. Jake takes his time answering, and the reply comes in fits and starts unbecoming of his smooth features. "Ha. You can't tell. That's kind of funny ain't it? Yeah, I was going to talk about my height. This." He pauses to look at his plastic hands as he gestures; he has no nails, no lines, no veins, no beauty spots or inconsistencies of any kind. "Custom bodies are expensive. So, I'm taller now. It's pretty weird." "How tall were you before?" asks Bill. The sense of unease still lingering in the room regains in intensity as Jake sits up straight and uses a hand to draw a line across his chest, his perfectly indistinctive face bearing a blank expression, his eyes locked with Bill's. From his seated position, the meaning of the gesture is unclear and several of the group members exchange tense glances. Bill frowns, realizing the implication, but presses on. "How old are you, kid?" Jake takes a quick glance to his sides. His voice is faint when he answers: "I'm ten." If you enjoyed this prologue, you should get the complete novel either on Amazon.com or on Itch.io! As an independent endeavor, the book is in dire needs of reviews and star ratings. If you would be so kind as to write a review and/or leave a rating, feel free to do so on whichever platform you like best. This will also help with the following steps of the projects, namely a story-board and a movie. Fierce criticism is welcome.